Today’s world is a digital one—which means you’ve likely thought about advertising your landscape business online but wondered about how to get started? Two of the biggest online advertising players that come to mind are, of course, Google Ads (formerly known as Adwords) and Facebook Ads. 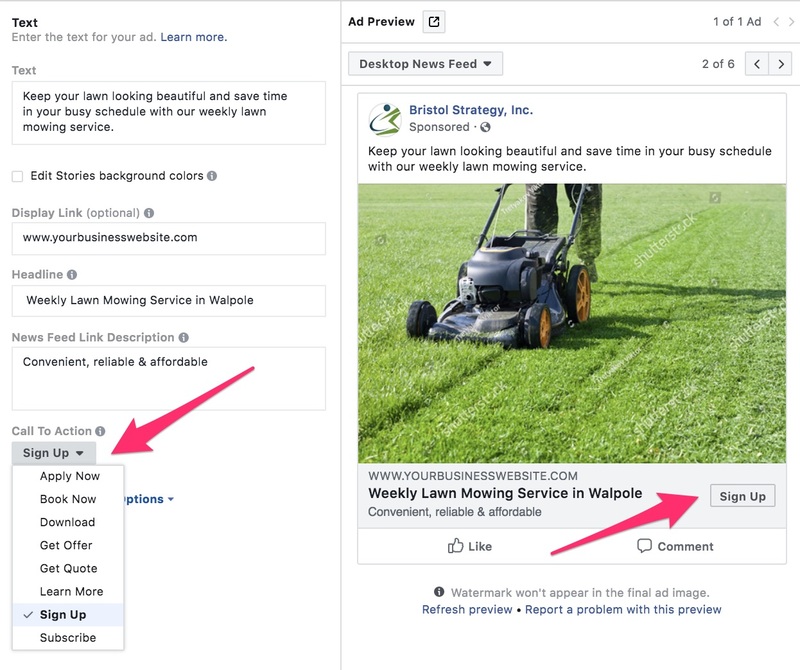 Each of these platforms have their own strengths; however, for this post, we’re going to focus on Facebook Ads, for a few reasons: its highly detailed audience targeting, ability to drive awareness of your brand, it is a better fit for B2C businesses, and emphasis on visuals (perfect for a landscape business such as yours). Since this is a long article that is chock-full of insights, we decided to provide a linked index here so you can read just what you are interested in. Why not advertise a landscape business on LinkedIn? Before we drill in, let's discuss briefly why you might want to advertise with respect to how your existing website may or may not be generating leads for your business. In this landscape business case study, we describe the steps we took to enable one landscape business to totally transform themselves, powered by a significant increase in qualified leads and sales. The growth in this business was generated online through a well-executed inbound marketing campaign.Once the investments were made, the leads flowed continuously and the rate of leads grows organically. When a business chooses an advertising strategy to drive traffic and leads, they are by default understanding that the growth of their business "coin operated" which means that once they stop advertising, the leads also stop. Our recommendation for any landscape business is to invest in building a long term sustainable lead generation strategy and use advertising to step on the gas when more business is needed. Before we drill into facebook ads, let's briefly talk about niche social and review networks like Houzz, Angie's List and Yelp. These three networks have been used by many landscape (and other local business) as the default platform for sharing examples of their work. These platforms also offer advertising to business owners. The most important advice I give landscape business owners when choosing to invest money advertising these networks is to use campaign links that enable your business to track the financial return on these and every advertisement you run. Here is a Google page about campaign links. Don't just link to your home page with a normal link. Link to a special landing page for each network with a clear call to action for the visitors. Install analytics on your website so you can track a lead all of the way to a call with your sales rep while identifying the source for each individual contact. As a landscape business executive, you may ask; why not advertise on LinkedIn? While we always recommend clients create a LinkedIn page for their business and to post articles and other business updates on LinkedIn, we do not suggest advertising on LinkedIn because the cost per lead is very high. LinkedIn is a great platform for B2B businesses but not so much for B2C businesses like a landscape business. Of course there are always exceptions to the rule, especially if you have a significant business clientele where your advertisement is very targeted to the right titles in your local area. If you have had success advertising a landscape business on LinkedIn, please add a comment so we can discuss you results. At the end of each month analyze the ROI of your advertising investment by dividing the project profit by the advertising investment ROI = (Landscape Profit / Advertising investment). If the landscape business is reoccuring, like landscape maintenance, then for the landscape profit use the profit for the season as the value in the numerator. You want a positive number for ROI, not a fraction. 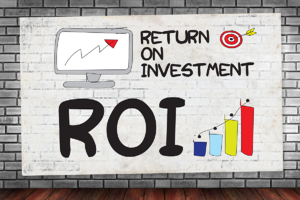 An ROI of 1 means it cost you as much to run the advertisement as the profit you earned. Here is a page that shows the ROI calculation. The reason I suggest measuring the ROI is because I see many landscape businesses (and other b2c business) wasting money on advertising that does not generate positive results. 1. Choose your ad type. The specific type of ad you choose will depend on the ad campaign’s objectives; on Facebook, these can include options such as website traffic, brand awareness, and engagement with your content. A generic example of a single image advertisement as it would appear on both desktop and mobile. When creating your ads, it’s critical that you have clear, compelling imagery, as this is what will capture a prospective client's attention. Facebook does offer free stock imagery; however, even better, your own landscape examples lends itself extremely well to the types of visuals that make great ads. Make a habit of taking photos before, during, and after projects while on the job site. You’ll want lots of image options available when creating your ads, so take photos and video from a number of angles and varying orientations (horizontal and vertical). As I mentioned above, a retargeting campaign is an additional option available through Facebook, that’s a bit different than the others listed above. Have you ever visited a website to learn more about a specific product, only to have that same product pop up over and over on Facebook and other unrelated websites? That’s a retargeting campaign at work. With a retargeting campaign, a snippet of code, called a Facebook pixel, is added to your website. The pixel tells Facebook when a visitor arrives on your website; once that visitor leaves your site and visits Facebook, an ad for your business or service appears. A website typically needs a steady amount of traffic to find success with retargeting campaigns; however, they can be a powerful option for keeping your business top of mind with clients. 2. Select your ad’s demographics and targeting. 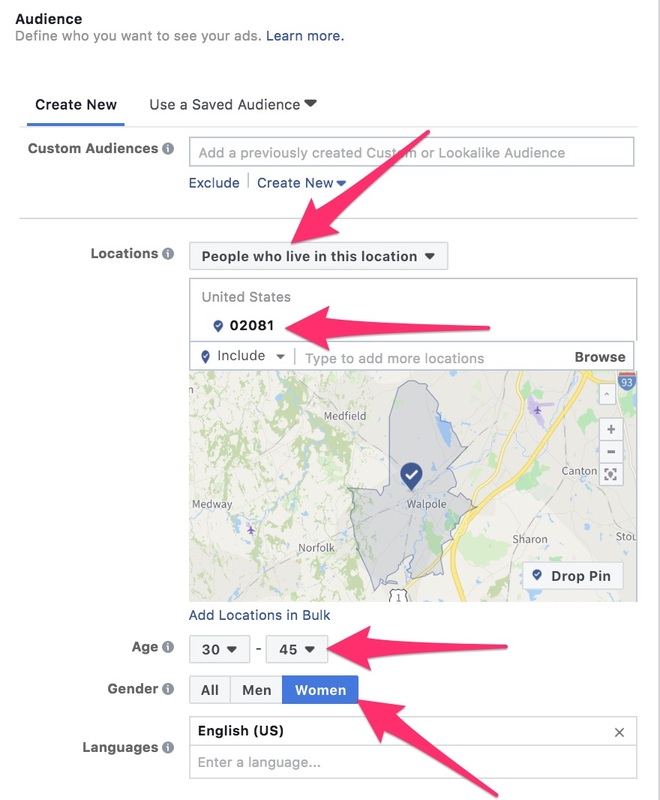 Using its demographic information, Facebook allows you to target your ads so that they display only to a very specific audience; for example, you could choose to deliver your ads to women homeowners over the age of 40. As a landscape business, one of the most important ways you’ll likely target your ads is to restrict them to audiences in specific zip codes, a practice known as geofencing. These zip codes correspond with your business service area, and ensure that your ads are seen by the people you are most likely to want to serve. 3. Focus your ad’s message. As a landscape business, you likely offer clients a variety of different services, which may include options as varied as lawn maintenance to yard clean-ups to landscape design (and lots more, too). With such wide-ranging expertise, you’d certainly want to create ads that show clients everything you can do for them, right? Resist this temptation to create a broad topic ad, instead each ad should have a singular focus. Prove to each prospective client that you’re the perfect option for them. If you try talking to everyone at once, you risk that you’ll end up connecting with no one. 3. Align the ad content and visuals with the specific service you are offering. Let’s say that you offer a weekly lawn maintenance package during the summer that you’d like to promote via online ads. You create copy describing the package’s benefits to the client: It can help them have a stress-free summer with one less thing on their to-do list, and they can even go away on vacation without having to worry about their lawn becoming a mess while they’re gone. Sounds great! So when it comes time to choose the ad’s visual, would you then choose a photo of a lawn full of leaves and other debris? That’s because it would cause confusion for your client. They’d think, “This company is telling me it can deliver one thing, but it’s showing me that it would deliver something else entirely.” They wouldn’t know what to believe. And let’s just say, this mismatch in client expectations does not inspire confidence in your services—or you. Make sure each aspect of the ad makes sense for the specific service you want to promote. 4. Choose the right landing page to which you’ll drive traffic. Successful online advertising is about more than just creating the perfect ad―you also need to think about what the prospective client’s experience will be once they click through and arrive on your website. Here’s a point I can’t emphasize enough: You must drive traffic to a landing page with content tailored to the specific services promoted in your ad. 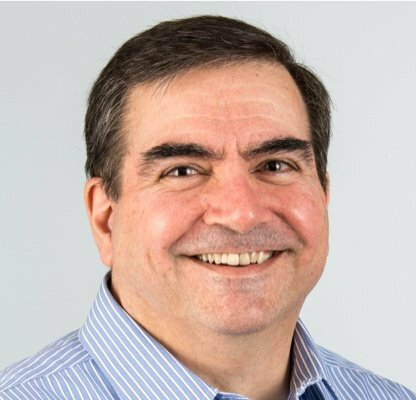 You cannot send traffic to your website’s homepage—in fact, we’ve found that ads that do so have significantly lower conversion rates than those that direct to a focused landing page because you are effectively asking the prospect to do the work finding the details of your service on your website. This mistake creates friction in the sales process. If you’re creating multiple ads to promote different services, you must create a custom landing page for each one. Think about it like this: When a prospective client clicks on your ad, they’ve already taken a crucial first step, indicating to you that they want to know more about that specific service. It’s critical that you “pay off” that interest by bringing them right to the place where they can learn even more. Don’t waste the click (and the money you spent on it) by sending prospective clients to your homepage and forcing them to hunt around for what they want and need. You will be sure to lose some of these prospective new leads in the process. When developing your ad campaigns, it’s critical that you remember this: Your ultimate goal isn’t to get more traffic to your website. It’s to get more clients and revenue for your business. For that reason, your campaign must include opportunities for measuring your results. Even if you get many clicks on your ads, if none of those visitors actually convert into clients, your campaign really hasn’t been successful. To make sure you’re getting the right results, you’ll want to calculate the cost to acquire a new clients all the way through to conversion. These conversion goals could include actions such as scheduling a phone call, setting up a meeting, or downloading a free ebook. You’ve created your ad, it’s started running, and you’re getting some traffic and even new leads. That’s great! But you’re not done yet. It’s a mistake to create an ad and simply run it forever, even if it is generating an ROI for you. That’s because slight tweaks to the ad could generate even better results for you—but you won’t know until you test them. When you A/B test your ads, you should change only one single element at a time—for example, test only changing the headline, but leave everything else the same between the two ads. That’s because if you test multiple elements of the ad at once, you won’t be able to isolate exactly which aspect is causing one ad to perform better than another. Be sure to review your ad campaign regularly, so you can quickly remove ads that are not performing well, and implement further testing against the ones that are. 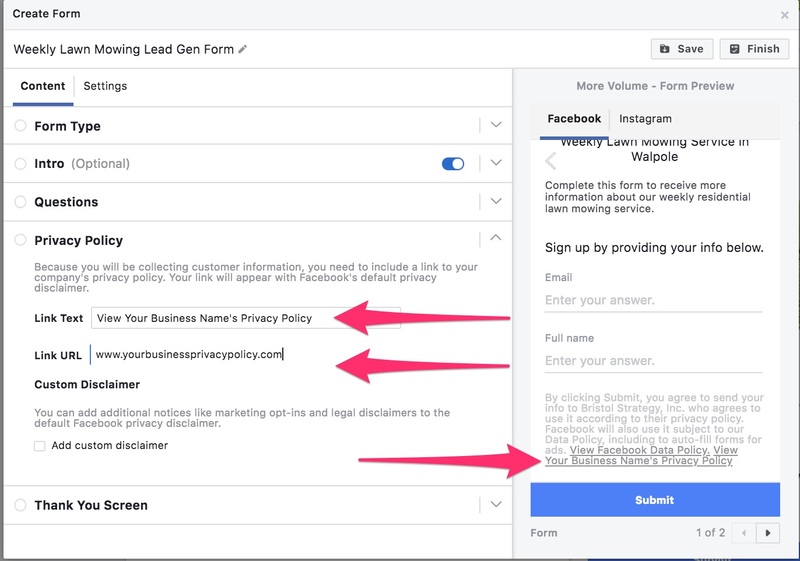 Facebook lead ads allow you to capture a prospective client's contact information directly within the Facebook platform, and can prove to be a powerful technique for growing your business via inbound marketing. 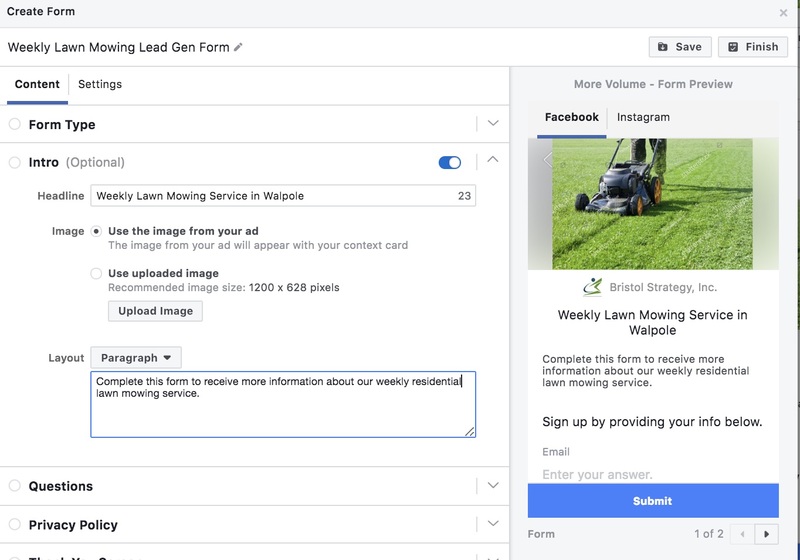 To help guide you in creating your first Facebook lead ad, we're going to create a fictional Facebook lead ad for a weekly lawn mowing service, using this helpful, step-by-step tutorial. 1. Go to Facebook Ads Manager. Navigate to Facebook Business Manager, then select Ad Accounts. If you have not yet created a Facebook Ads account, you can find instructions on how to do so here. Once you're in your ad account, select Create. When creating a Facebook ad campaign, you can choose from a number of different objectives for your ads. 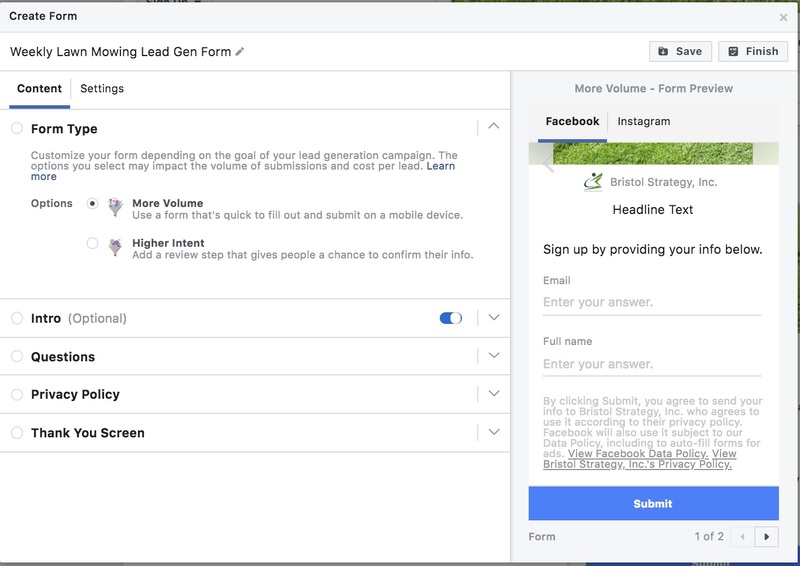 We're going to select Lead Generation (also called Lead Ads) because when the person clicks on the add button, Facebook provides the user with a form and automatically populates it with the information you are asking for from the user. When a lead converts, Facebook sends the lead to you. We are showing the Lead Ads example because the conversion rate of these ads are generally higher than ads that redirect to a landing page on a website. Next, you'll want to name your campaign. It's important to choose your campaign, ad set, and ad names carefully, as a well-organized approach to naming can be extremely helpful in reviewing your campaign analytics, understanding which ads are performing best, and calculating ROI. For example, let's say we want to test two different types of ad objectives for our lawn mowing service: lead generation and traffic. Because these particular ads we are creating are lead generation ads, we'll include that term in the ad campaign name. 3. Name your ad set. 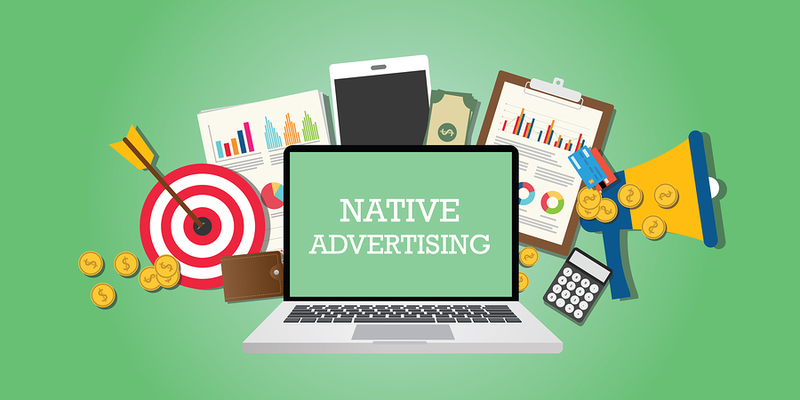 Next, you'll be prompted to name your ad set, which is a group of ads that share a budget, audience, campaign schedule, bidding, and placement. For our lawn mowing service, we've decided we want to create different ad sets targeting prospective clients in different towns. This particular ad set will target individuals who live in Walpole (Bristol Strategy's hometown). But, location isn't the only criteria we want to use to target our ads. We'd also like to break down our ads by gender, and age range, to see if there is a difference in how these audiences perform. So, this ad set will target women age 30 to 45 who live in Walpole, and we've named it accordingly. 4. Define your target audience. Now it's time to choose your audience targeting. First, we'll add the audience information we outlined above: location, age and gender. Because we've chosen to target this ad set to an audience in a single town, we've selected only a single zip code for the location. However, Facebook also gives you the option to target multiple zip codes, or a specific radius. In addition, because we're promoting a service targeted to homeowners, it's important to select "People who live in this location" from the dropdown. 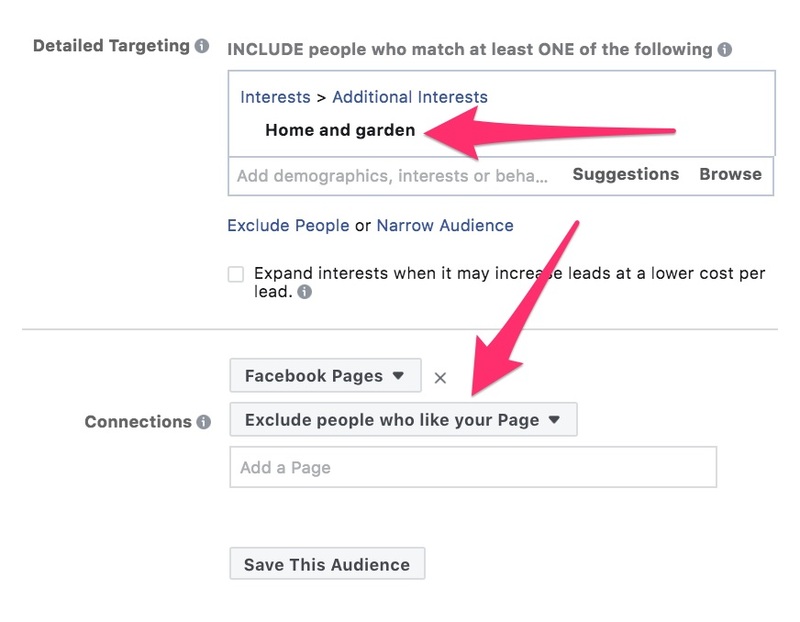 In this same section, we also can use detailed targeting options to further refine our audience. 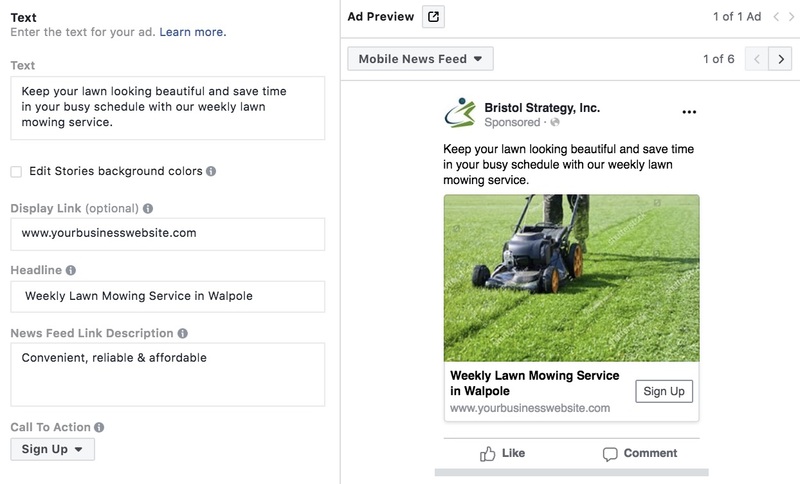 While Facebook no longer allows ad campaign managers to use certain demographic factors such as home ownership to target an audience, we can target users who have expressed an interest in home and garden topics, as they may be more likely to be interested in our lawn mowing service. 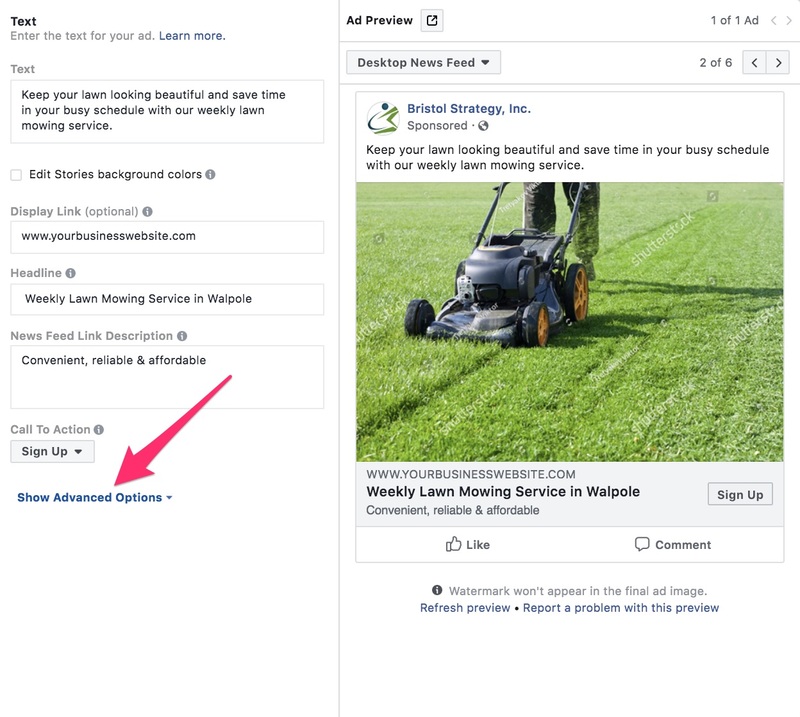 In addition, with these ads we'd like to reach new prospective clients who are unfamiliar with our landscape business, so we're going to choose to exclude users who already like our business's Facebook page. A well-defined audience can help increase your ads relevance score, which is a metric on a scale of 1 to 10 that measures how well your ad resonates with your intended audience. The higher the relevance score, the lower your ad's cost per click (CPC) will be. You want to aim for a relevance score of at least 5. 5. Set your budget and schedule. With our audience finalized, it's time to choose our ad set budget and schedule. You can select either a daily or lifetime budget (a lifetime budget is a maximum amount your ad set can spend), as well as a schedule that either runs your ads continuously until you choose to stop them, or for a specific timeframe. Now you need to create your ad. To help us keep track and stay organized, the ad name will include the campaign and audience information we already defined. This ad will use a photo of a lawn mower, so we'll also include that information in the ad name, to help us easily differentiate between multiple ads. Next, you'll need to select your format and media. For this ad, we're going to choose single image. If you already have an image or graphic you would like to use for your ad, you can then upload it. This is a good time to show your branding through either an image of your team delivering the service or one of your trucks. 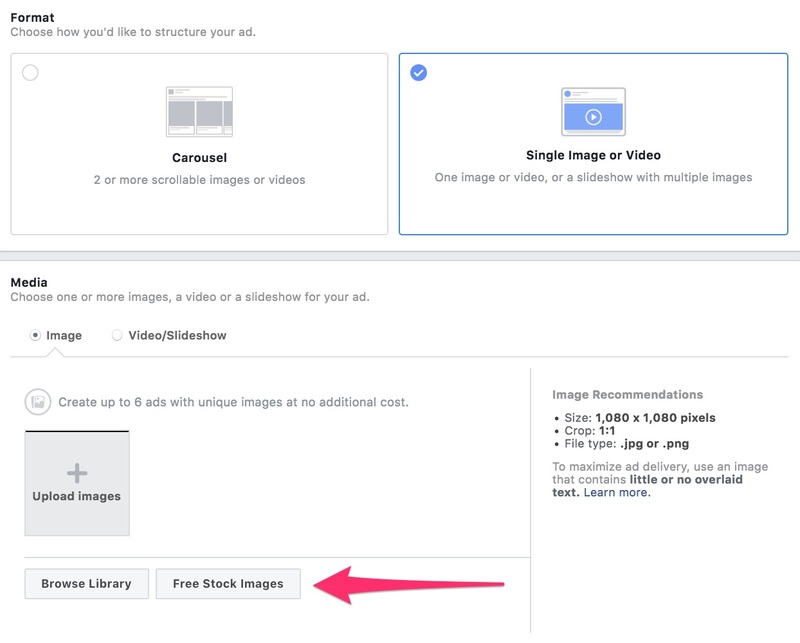 If you have not yet selected an image or graphic, Facebook offers a library of free stock images for use in ads. Once that's completed, you can create the additional ad elements. Note how we added the target audience's location (Walpole) to the headline, to help better attract their attention. You also can preview how your ad will look based on its placement. Below is how our weekly lawn mowing service ad looks in a desktop news feed. In this version, you'll also see the news feed link description appear below the ad's headline (this text does not appear in the mobile news feed ad shown above). Finally, it's time to choose your ad's call to action, which is the button that will appear on your ad. 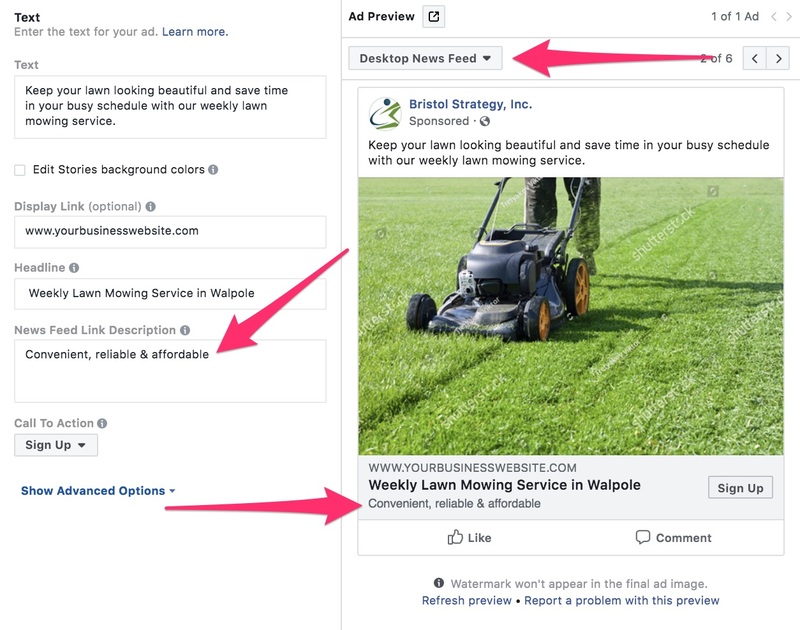 Under Advanced Options, you also can enable Facebook Pixel, which helps you measure how effective your ad campaigns are by tracking visitors' actions on your website. While Facebook Pixel is not required to run ad campaigns, it is best practice to do so. You can get more information about Facebook Pixel and instructions on how to set it up here. 7. Create your lead generation form. Because the objective of this ad campaign is to generate new contacts for our business through Facebook, we also need to create a form to capture these leads. Then, complete the intro. This step is optional, but is a good opportunity to provide additional information that can help incentivize prospective clients to complete and submit the form. Next, you'll select the information you want to capture from each prospective client. 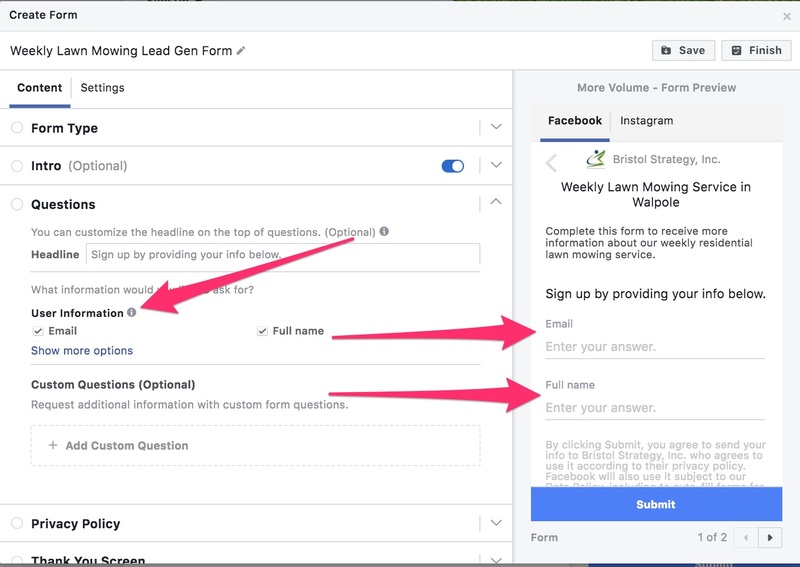 While you can add additional form fields beyond the Facebook default of email and full name, or even create your own custom questions, it's important to keep in mind that the more fields a form has to complete, the less likely a potential lead is to complete it. Consider adding only what is necessary to achieve your objective. Finally, you can customize the message the prospective client receives once they've submitted the form. 8. Integrate your leads with a marketing automation platform. At Bristol Strategy, we use HubSpot for marketing automation. HubSpot's free Marketing Hub package allows you to move new leads directly from Facebook to the HubSpot dashboard, where you can begin integrating those new contacts into your inbound marketing campaigns. 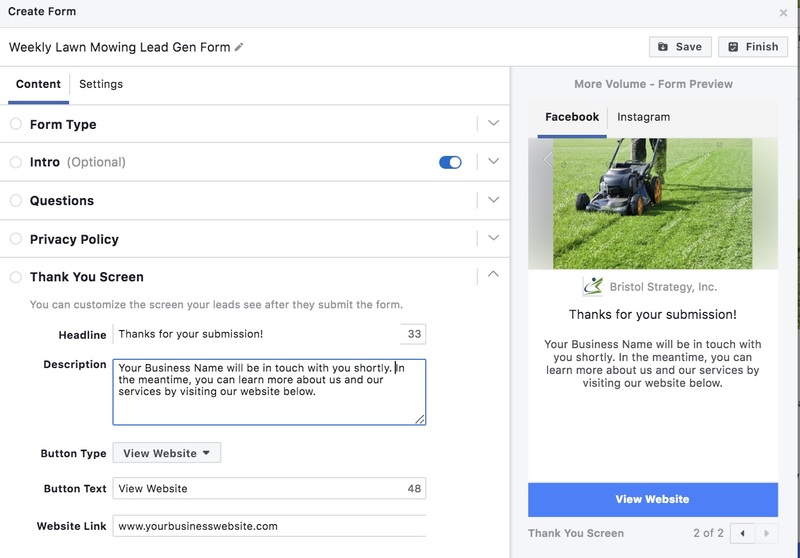 We have several B2C clients who are using the free Hubspot Facebook Lead Ads integration to capture leads and manage their follow up and pipeline. Reach out to us and we will help you get started. Online advertising platforms such as Facebook offer an incredibly powerful way to connect with prospective clients who may not already be aware of your business. Paid ads provide you with an immediate opportunity to drive traffic and leads while you execute on another method of building traffic, particularly organic: implementing an inbound marketing strategy that is the core to creating an inbound marketing sales funnel like we have discussed previously. With an inbound marketing strategy, you’ll make an upfront investment in creating valuable, educational content that can drive traffic to your website and generate new leads for free for years afterward. In fact, we believe it's the best way to grow your business. See how we helped other businesses like yours by reading this case study. Interested in chatting more about how online advertising campaigns such as on Facebook can complement an inbound marketing strategy? Book a one-on-one call now to discuss it.